Chris and Teresa Green of Chris Green Media with the Mayor of Worcester, Jabba Riaz and Worcestershire poet laureate emeritus Maggie Doyle. Photo: DAP Photography. 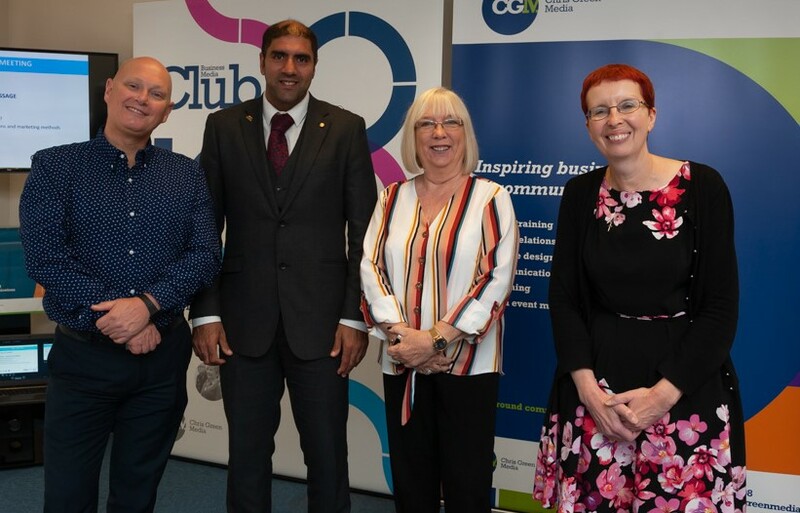 The Mayor of Worcester Jabba Riaz was among those joining the celebrations at the Business Media Club’s fifth anniversary meeting. Current and past members shared experiences with visitors of how the club had shaped their approach to marketing and Worcestershire’s poet laureate emeritus and club member Maggie Doyle recited a specially written poem. The club’s continued success is due to blending listening with learning and our ‘all egos are left at the door’ approach which encourages people from a wide range of businesses and organisations to have their say and to exchange ideas in a sharing environment. The next Business Media Club meeting will be held at CGM Media Centre on Friday, October 26 at 9.30am and the theme is Getting on Message. Future themes in the 2018-19 programme will include thought leadership, storytelling and lead acquisition marketing. The press release has appeared in the Worcester News, Worcester Observer, Business & Innovation Magazine and on the Greater Birmingham Chambers of Commerce website.